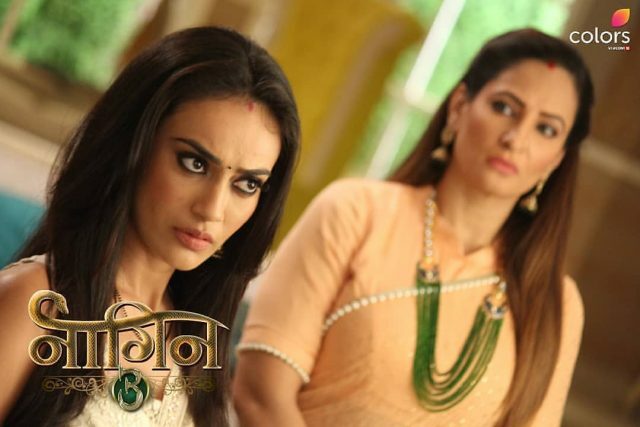 In the latest of Naagin 3, 11th November 2018, new entrants bring more troubles for Mahir and Bela. The Today’s update of Naagin 3 begins with Mahir telling that someone wants to ruin him after he is ruined. He asks Yuvi and Bela to hang DND billboard outside the room. Yuvi said that not a bad idea. Mahir told that Bela everyone is waiting downstairs. He goes. Vikrant cames in his avatar and asks Bela to go and say I will handle, and asks her to keep away from moonlight. Bela cames out and think that what did I do? She doubts herself and thinking if she killed Poulomi. She sees Mahir and comes running to him crying and hugs him. Mahir asks to her that what happened and asks her to sit and told to him. Bela is about to tell him about Poulomi and blames herself that she tries to take the things right, but the opposite happens. Mahir hugs and comforts to her. He said that everything will be right. Vikrant packs Poulomi’s body in the cover and said everything will not be fine with you, Ruhi. His mum cames there. Vikrant said I was thinking that what you will come, said I told you that she will get trapped in the illusion and will doubt on herself. He said that she played with my heart and I will play with her mind. He said that she played with my heart and I will play with her mind. To know this he feels so happy and relaxes. He said to her that he produces to get the life partners like this. He said that Bela will kill to Mhair and then she will lose all her strength and then we will get Naagmani and rule on this world. After getting this I was the only queen to rule the whole world. Precap: Vikrant told his mum that these people can not ruin their game, but they will follow their plan. Mahir ties Kamarband to Bela’s waist. Vikrant tolds to him that you have done my work, Ruhi got haldi applied of my name, she will wear the wedding dress and will marry me in a few hours.